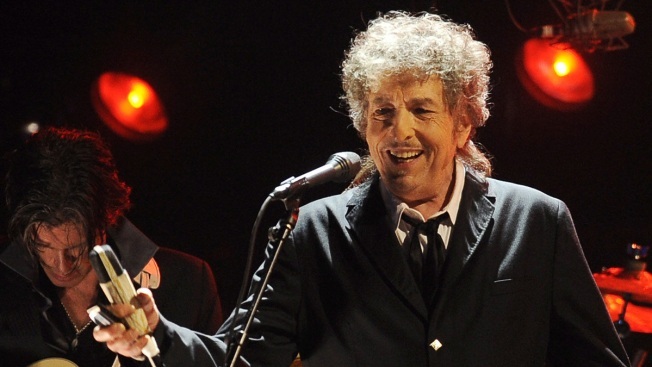 File - In this Jan. 12, 2012, file photo, Bob Dylan performs in Los Angeles. Dylan recently did a rare interview in which he discussed his relationships with stars like Elvis Presley and Frank Sinatra. Bob Dylan opened up about his music and songwriting and discussed his relationships with Frank Sinatra, Elvis Presley and others in a rare and lengthy interview posted exclusively to his website Wednesday. In the Q&A with author Bill Flanagan , Dylan recalled Sinatra telling him, "'You and me, pal, we got blue eyes, we're from up there ... These other bums are from down here.'" "I remember thinking that he might be right," added Dylan, who last year was awarded the Nobel Prize in literature, but did not show up to accept the award. A person close to the Dylan camp, who spoke on the condition of anonymity because the person was not allowed to publicly talk about the topic, said Dylan wanted to do an interview for his website and Flanagan, a writer and former MTV executive, agreed to do it. "No money or other compensation was involved," the person said. Of the many superstars who died last year, including Muhammad Ali and Merle Haggard, Dylan said in the interview the deaths hit him hard. When asked about why Presley didn't show up for a recording session with Dylan and George Harrison, he replied: "He did show up — it was us that didn't." Dylan, 75, said he was also a fan of Amy Winehouse, who died of alcohol poisoning in 2011 at age 27. "She was the last real individualist around," he said. Dylan will release a new triple disc album of standards called "Triplicate" on March 31. He said he's a fan of somewhat recent albums from Iggy Pop (2012's "Apres"), Imelda May, Valerie June and The Stereophonics. He also said he enjoyed "Here We Go Again: Celebrating the Genius of Ray Charles," the 2011 tribute album by Willie Nelson and Wynton Marsalis featuring several tracks with Norah Jones.